Burra Haven is 22.65 hectares – 55.97 acres of prime rural land adjacent to one of the fastest developing areas on the Sunshine Coast Bli Bli. 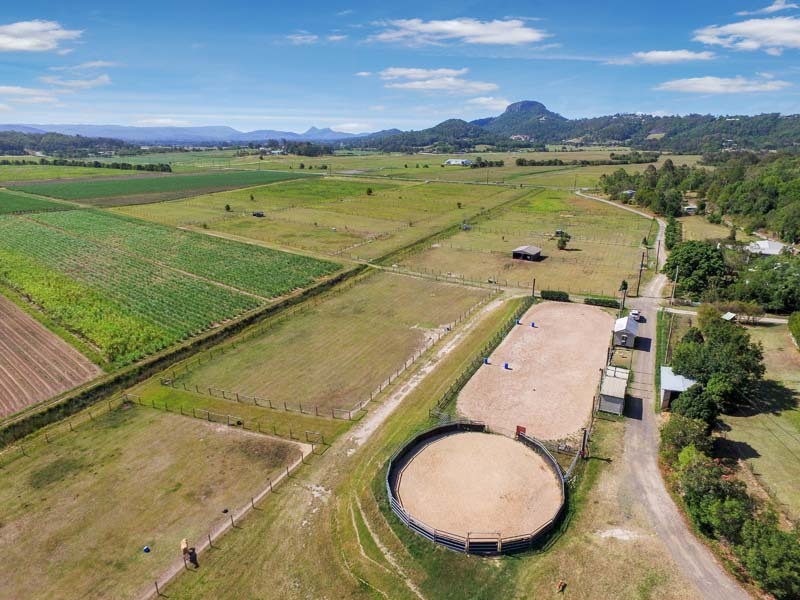 The property has been developed into a horse stud and agistment property which includes over 20 acres of undeveloped land at the rear that gives the new owners choice and flexibility in relation to additional enterprises. There is a substantial modern five-bedroom home on the property over three levels that also gives flexibility with income if desired. The home comes in three sections the original, the new and the apartment. The original section has two bedrooms, modern kitchen with attractive timber benches with the latest appliances, lounge and dining area with polished parquetry flooring opens out onto a cool verandah with beautiful rural views. In fact, spectacular rural views of Mt Ninderry and across the Maroochy River Valley are obtained from almost anywhere on the property. A main bedroom which is a half a floor higher has a walk-in robe, ensuite with bath and shower. The bedroom opens out onto its own private verandah with views! The second bedroom is also on this level plus the main bathroom with bath and shower. Beautiful polished hardwood floors lead you from here into the new part of the house where there is a sitting room, a powder room and two bedrooms opening out onto another verandah. The master bedroom is extra-large (5.8m x 4m) and has a custom built walk-in robe for him and her. The ensuite has a unique feature bath, vanity sink and incomplete shower (just needs a tiler to visit to complete). On the ground level, there is a one bedroom apartment with kitchen, bathroom and internal access to the upper level. This is currently being rented at $200pw while the original part of the house is being rented for $450 pw and with some modifications the new section could also be rented if desired or the entire home can be utilised for those looking to house a large family. Air-conditioning is via ducted and split systems. A vac-maid has been installed to make cleaning easier. There is a large two car carport for family vehicles with concrete driveway all the way from the road. The home totals approximately 400 sq m of living area under roof. The equine facilities are outstanding 23 paddocks with 10 having day shelters or stables. Fencing is split hardwood timber posts, 3 plain wire and a hot wire. Laneways give easy access to all paddocks. There is a 20m x 60m sand arena with layout rails. The arena is LED flood lit for night riding and has a CCTV for security. The round yard is 20m in diameter and is constructed of cattle panels and rubber. A stable block with four shelters services four paddocks another stable building has two shelters plus a single stable building with one shelter. There are also three open day shelters. A 6.5m x 3.5m shed acts as a feed and tack room. There is a 6m x 3m transportable building for further storage with adjacent double wash down bays. The arena viewing building is unique and very functional. It was originally a lunch building for the children at the Nambour High School. A central bore near the home pumps water to all paddocks with each having its own tap. The property has excellent forest horse riding nearby and would truly be an attraction to agistees and guests. Nearby is the 5,000 acre Parklands State Forest with many kilometres of trail riding – ideal for the endurance riding enthusiasts. Across the road is the Dunethin Rock Park area on the Maroochy River. The undeveloped 20 acres at the rear of the property is the best of the land. Elevated and backing onto a bushland and a rainforest creek with a dam with pontoon, this land could (with Council approval) be utilised for eco camping, a caravan park or cabins. Income could be obtained from the agistment at the front and eco-tourism at the rear. 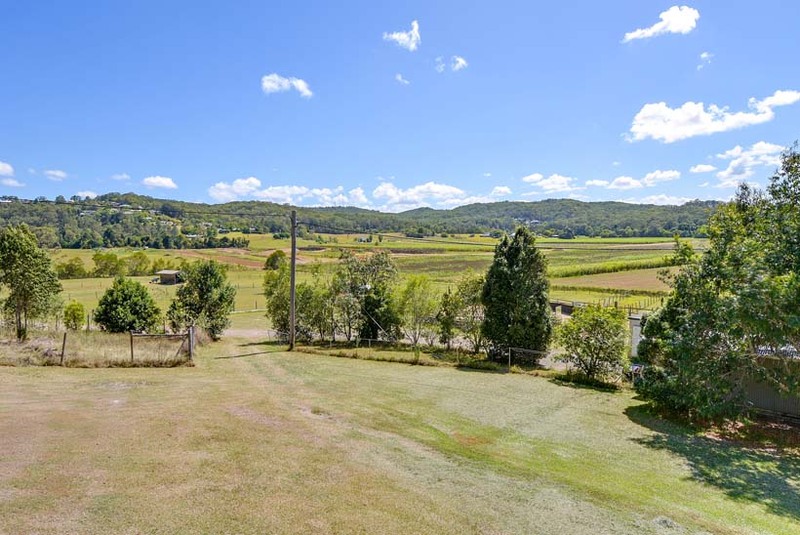 There is also a beautiful home site with fantastic views to Mt Ninderry. House plans are already drawn for your dream home. This property will be sold in conjunction with the neighbouring properties Lot 2 488 Yandina Bli Bli Road (7.1 Ha or 17.6 acres) and Lot 6 – 482 Yandina Bli Bli Road (4628 sqm). Total area 30.24 Ha or 74.7 acres. This is truly a great opportunity to acquire a quality property in one of the coasts fastest developing corridors with future demand assured. It is rare to get such a quality horse/ development property so close to expanding suburbia and what makes it even better is that this property must be sold today. We have genuine sellers who are willing to meet today’s market. Inspect today and make your offer. If not sold prior to, then the property will be sold at auction on Saturday 28th January at 452 YANDINA BLI BLI ROAD, MAROOCHY RIVER at 3 PM. For full details and or inspection contact the marketing agent Greg Young 0488 238 988 Horse and Farm Specialist.